There is not the person whom I do not know among the customers who is wishes to be made the purchasing. Wow that’s almost as useful as most TV reviews here in the US. bouncy-bouncy before marriage? 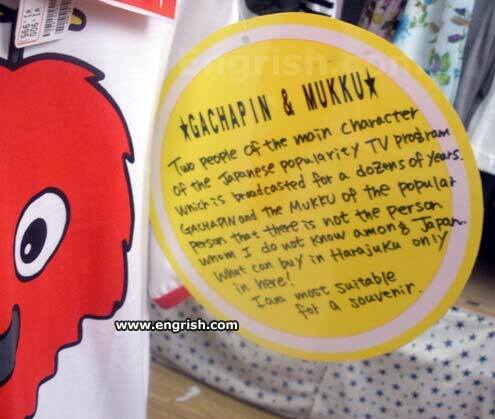 A very special “Gachapin and the Mukku” Tuesday night at 8, 7 Korea time. Honorable Shopper: I am most suitable for your purchase times. Please popular me. – There is not the person whom I do not know among Japan. Well, that’s easy for you to say. It’s not easy for me to say. A person I know lost his ears in Suva. Tyhey would have been Suvenears – right?? And such a splendid example of Engrish most certainly is! Mukku has become a meme in the USA…and an annoying and confusing one too. What cannot buy at Harajuku is not here! Am I correct? Of course they spelled “souvenir” right. It’s French! Hmmm… let’s take a look at the “Flench” website. Wonder where they got the name Gachapin. Spanish, perhaps? It is one letter off from “gachupin”, a Mexican epithet for a white Spaniard, much stronger than “gringo”, implying a colonial Spanish landowner, or even a conquistador.